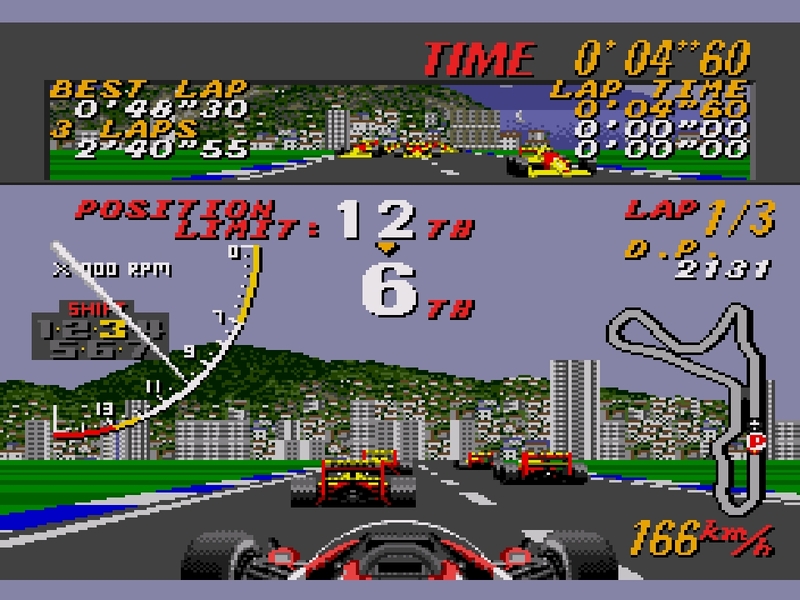 Super Monaco GP and its Senna-endorsed sequel were among the first racers I played on my Mega Drive as a kid. 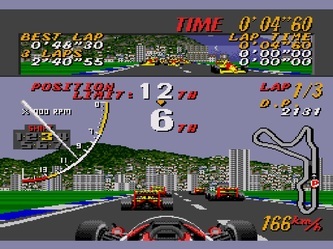 To a child’s eyes, the cockpit view may not have seemed all that significant, yet amongst a sea of top-down and third-person speedsters, it would help to define SMGP as perhaps the standout console racer of its time. It was enhanced by (or perhaps, helped to further enhance) a superbly accurate handling model and a stonking sense of speed, whilst it also delivered nifty damage parameters and a World Championship mode of unparalleled depth and intrigue. There was more to SMGP than other MD racers of the time. 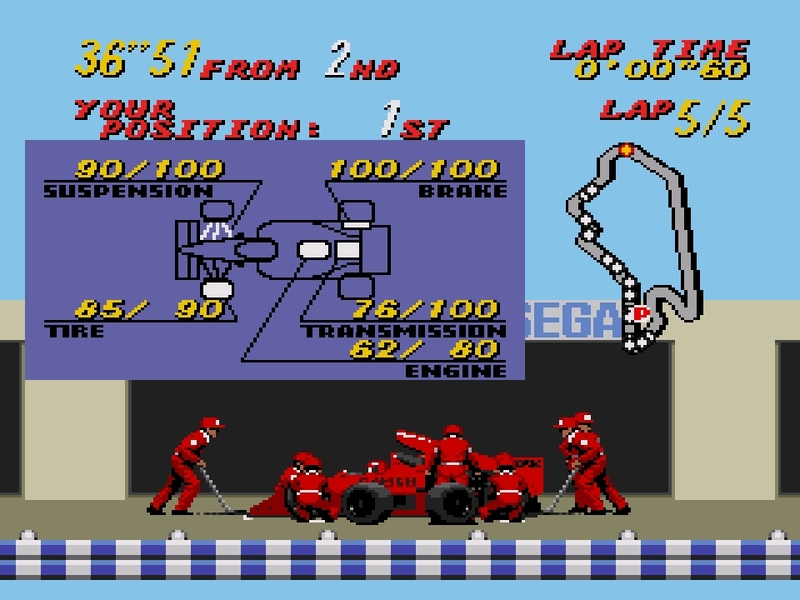 The gruelling, 16-race World Championship challenged the player to work their way up from rookie obscurity into top teams by beating rivals and scoring consistently. One lap qualifying proved an exciting and immediate way of deciding the grid, before a five lap race that would last around three minutes. 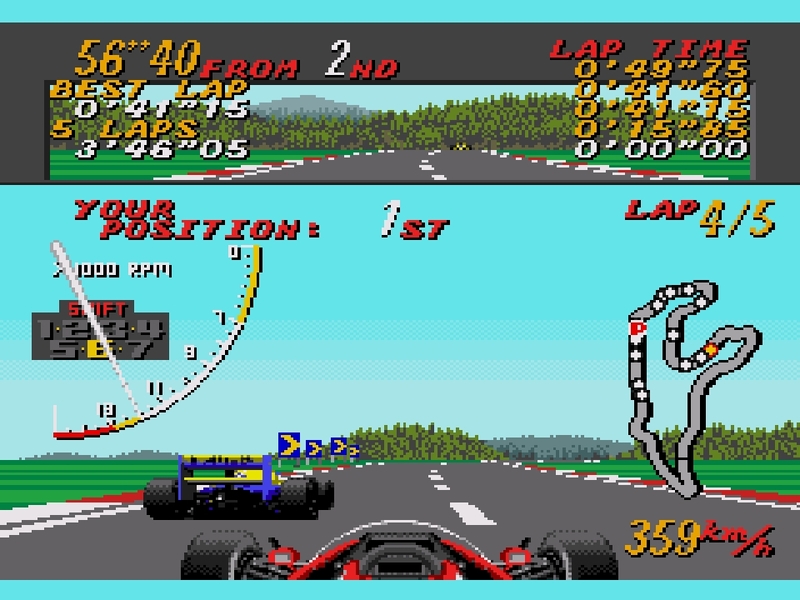 The starts remain as frantic and exciting as they ever were, as you desperately snake between cars whilst trying to find a line for the first corner that won’t see you smashing into another car and losing all momentum. Too many trips into the scenery and acceleration, gear-changes and the fluidity of the handling become compromised. Unusually, it encourages the use of a manual, seven-speed gearbox, as though a bit trickier than the automatic, it allows for greater top speeds. Besides, the gears are great, proving particularly helpful in scrubbing off speed for the sharper corners. The World Championship forms the meat and potatoes of the experience. Starting off with a modest team, your task throughout the opening season is to challenge and defeat competitors in a bid to take their seat in a stronger car, whilst aiming for some consistent points finishes in the process. The end of season shake-up proves especially exciting as you wait to see who has signed you up. Every title screen should have one... That's right: an options menu! Just the 56 second lead at the start of lap four. Fix! 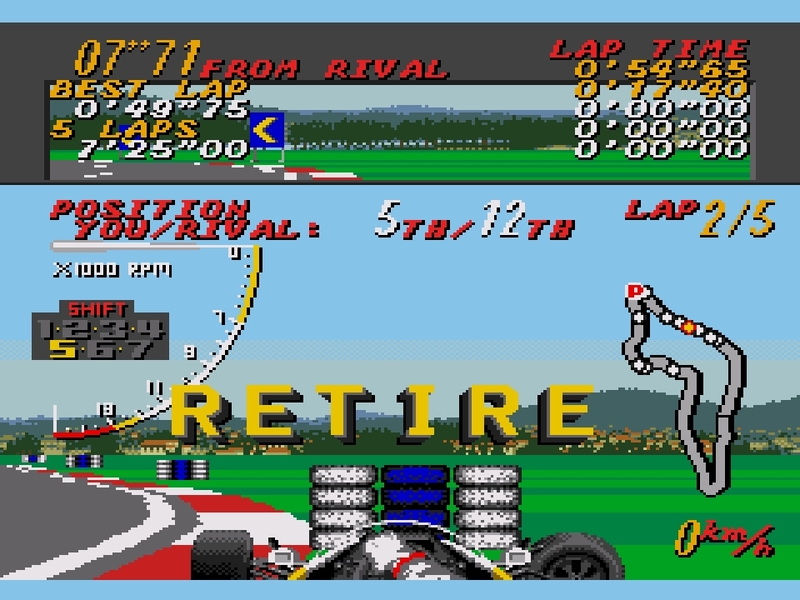 Most games would say “hey, you won the title, so enjoy the credits”, but Super Monaco GP is cleverer than that. In fact, as your eyes glaze over that lovely trophy you've snatched from the Prost-inspired A. Assalain, the game is already plotting your downfall. 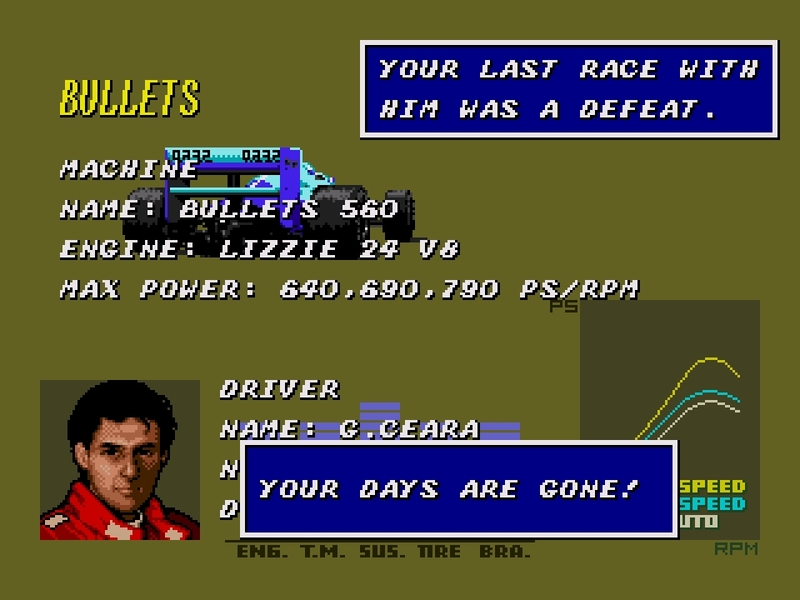 Your first race as champion in the coveted Madonna car sees you challenged by a new face in the form of G. Ceara, who draws certain parallels with another Brazilian champion of the time. 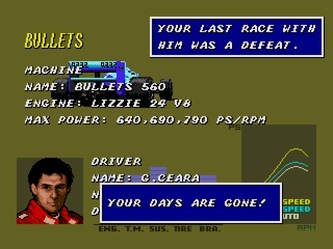 Should his ethereal pace defeat you (and it almost certainly will) in the opening couple of races, he’ll inherit the Madonna drive and you’re dumped back down to the lower end of the grid, written off and taunted by whoever else you challenge. To retain the title, you’re going to have to work quickly, poaching the better seats and moving back into contention as quickly as possible. It was an exciting era for F1, and the adrenalin-pumping nature of a dangerous sport are captured in thrilling fashion. Cars frequently top 430kph, and the superbly-implemented slipstream mechanism allows you to glide past cars you’ve caught up to on the straights. Of course, there’s more to Super Monaco GP than a race around the streets of Monte Carlo. The game echoes with great race tracks long since consigned to F1 history; the awesome concrete jungle of US street circuit Phoenix and the straight that goes on forever in Mexico City are but two examples. Living life on the limit also meant for fast, non-sanitised versions of Montreal, Imola and Hockenheim with its gargantuan runs through the German forest. Monza disappoints, with the chicanes, Lesmos and Parabolica presenting no challenge whatsoever, but in fairness, the vast majority of the tracks are really good. A broken Ferrari in the pits, a common sight in the early nineties. How ever did Benetton snap up Schumacher with such modesty? 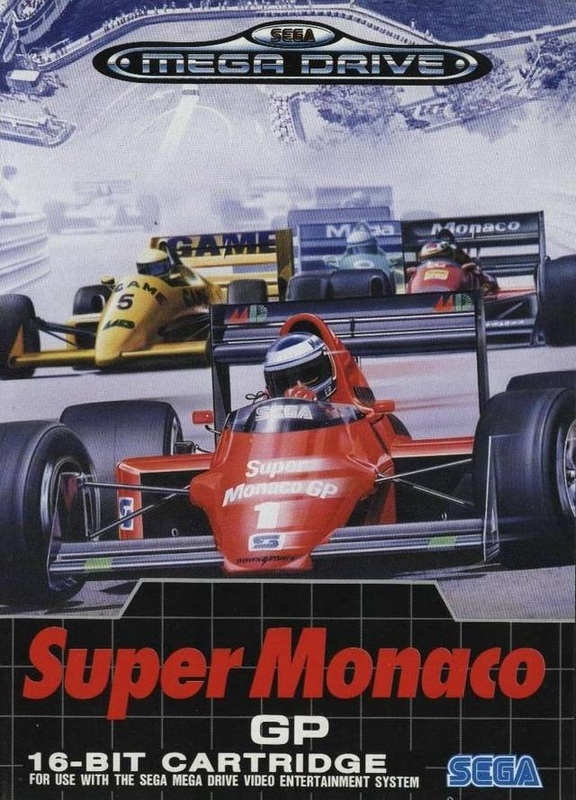 Super Monaco GP really looks the part too. 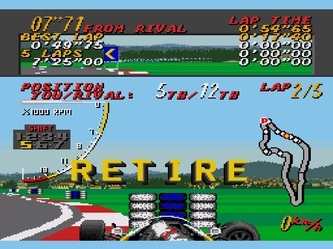 Granted, it’s doesn’t recreate the 3D scenery that the arcade game possessed, but the speed remains high and the general scrolling is considerably smoother on the Mega Drive version. Opposition cars move convincingly, though it’s a little disappointing that, during the races, they all share the same livery, despite sporting distinct designs on the rival select screen. The attract screens and menus are bright and glamorous, whilst the music is perfectly geared towards cranking up the excitement and anticipation pre-race – the only blot on the audio side is the rather curious squeaking noise the tires make on cornering. Progress through the Championship can be recorded through a password system, though given that it’s a whopping 64 characters long, there’s no question a battery save would have been more suitable for such a complex setup. A bigger downside still is how easy it all becomes once gears and courses are mastered to a decent standard. Even in fairly middling motors, it’s a breeze to win races by more than half a minute, and in any of the four A-Class motors, you can pull out more than twelve seconds a lap, which makes things an absolute cakewalk. There’s no question that it’s at its most engaging when you’re scrapping for points and drives in the beginning, but it takes nothing away from the satisfaction of winning the title because it feels like you’re embarking on a more involved racing quest with a beginning, middle and end. Faster, better-looking and considerably more in-depth than the majority of its 16-bit counterparts, and would completely cane pretenders such as the hapless Ferrari Grand Prix Challenge. A more competitive field wouldn’t have gone amiss, but SMGP is a white-knuckled ride that neatly captured the reckless pace and gleeful wheel-to-wheel racing of its day.